It had been months since Ky's supposed disappearance in the Snowager's lair. Things had changed. For instance, Rusty, who was a red Kyrii when she disappeared, had since then been painted Starry, and Bree had won the Caption Contest twice in a row. But whenever she-any of them, really-saw a Halloween Ixi, they got misty-eyed and couldn't talk or joke around for a little while. One day, Rusty, Fluffy and Fly approached Bree while she was reading the Neopian Times glumly. "Um, Bree?" began Rusty tentatively. Rusty nudged Fluffy and she stumbled forward. "Um, Bree… Rusty and Fly and me-I mean, and I-were talking today, and… well…" Fly jabbed her in the back with his beak, she jumped, and blurted out what they'd decided to say. "We think you should adopt another pet. I mean, Ky's been gone a LONG TIME. Maybe she's… you know… maybe she… isn't coming back." Bree just looked at the three pets stonily. Then she sighed, and the stony expression dropped to reveal a crushed look. She folded her paper carefully, laid it down in front of her, crossed her arms on the table and buried her face in them. Her shoulders shook with silent sobs, and the three pets were horrified at what they had done. Rusty was the first to run to her and throw his arms around her. Fluffy was right behind him, and Fly took one huge step and he was there. They stayed like that for ages, the three pets holding the weeping teenager, the teenager clinging to the pets as if they were the only thing that could help her… which I guess they kind of were. However, contrary to what her sister and two brothers thought, Ky was not dead. While she was running, she realised that the Snowager would have stretched out to his full length to get them, thus leaving his treasure unguarded. She knew what was in that trove of his, and she had a plan. She turned and raced into his lair again, snatching up a glass Negg and chucking it at him. He was dazed just enough for her to grab the Baby Paint Brush and swipe him with it. In an instant, he was a little worm trying to bite her hoof. She smirked and trotted off to find her family, but they were gone. She called to them, and the only answer she got was the sound of her own voice echoing back to her. She ran out of the cave, her hooves tapping on the ice. She slipped and lost her balance and ended up skidding into a snowbank. Shaking snow off her wings, she looked around. It was getting dark and cold. She walked gingerly past the Scratch Card Kiosk, where the Wocky who ran it was just closing up. She approached him nervously and said, "Excuse me, sir? I was wondering if you could take me home to Neopia Central? I seem to have lost my owner and siblings." The Wocky smiled sympathetically, but did not offer to take her home. He just walked off into the rapidly growing darkness. Ky called after him, "Wait! Please, wait!" but he kept walking until she couldn't see him. Ky sat down heavily in the snow. It was now so dark that she couldn't even see her hoof in front of her nose… it didn't help that her hooves were black, either. She started shivering in the below-zero weather, hugging herself in a frail attempt to keep herself warm. To make matters worse, it began to snow; lightly at first, then harder and harder until the snow was whirling around the poor little Ixi and howling in her sensitive ears. Ky squinted through the thick blizzard and saw a glimmer of light a little ways off. She gasped in joy and relief and tried to fly towards it. The wind made it slightly difficult to steer, but she made it. She saw that the place was the Neggery, and the light was coming from a window. A sudden gust of wind nearly knocked the Ky off her feet, but she flapped her wings frantically and flew toward the door at full speed, horns lowered. Inside, the Negg faerie was sitting at the window watching the storm wail when she caught a glimpse of a bright red flying bat-like thing. She furrowed her brow and leaned slightly closer to the window, trying to see if she could find it again. Suddenly, a THUD jolted her from her seat. She stood up and opened the wooden door and in fell a shivering Halloween Ixi. "Oh, my goodness!" gasped the Negg faerie. She dropped to her knees beside the pitiable waif and stroked its frozen fur. "What happened to YOU??" she asked in horror. The Ixi looked up at her and whimpered. The Negg faerie smiled, closed the door, and went to get a blanket for her guest. While she was gone, Ky looked around the little place. It was warm and cozy, and the decorations were all very… Neggy. The faerie returned with a warm, fuzzy blanket decorated with-can you guess?-Neggs! She wrapped it around Ky's shoulders and led the Ixi to the fire. When Ky was comfortable, the faerie sat down next to her. "What's your name, little Ixi?" she asked. "I'm Kylie_872, but my family calls me Ky," she replied shyly. The two chatted long into the night, and Ky slept curled up by the fire with the Negg blanket around her. The sun slanting through the window woke her up and she shivered. The Neggery was cold and the fire was now nothing but slightly glowing embers. "Good morning!" a cheery voice greeted her. Ky looked up with sleepy eyes and saw the faerie looking down at her, smiling brilliantly. For a moment, Ky was reminded of Bree, and her face fell when she realised she was alone. The faerie dropped to her knees and hugged the Ixi. "Don't be sad," she said comfortingly. "You'll get home eventually. But for now, you stay with me. I can't leave here, and I can't let you go out alone, but I get a vacation in a few months. We can go find your owner then. Would that be OK?" She looked so eager to please, Ky had to say fine. The faerie grinned, and tossed Ky a Smiley Negg. "Eat this," she instructed. "You'll feel great." Ky looked sceptical, but chewed the Negg carefully. As soon as she had finished, a huge smile spread over her face. "That was AWESOME!!" she commented happily. "I thought you'd like it," laughed the faerie. Suddenly, there was a knock on the door. "I have to take care of some customers, so why don't you go play Snow Wars or Grundo Snow Throw... or maybe you could hang out at the Scratchcard place? Try to make some friends, kay?" "It's Ky, actually," responded Ky without thinking. The faerie laughed merrily. "You make me laugh. Here." She handed Ky a bag of Neopoints. "Use these for whatever you need. Games, scratchcards, bribes, anything." Ky giggled and the faerie tossed her a wink. "Now scoot!" Ky thanked her and left. For the next few months, she made lots of friends, like a Snow Aisha called Brownie, a Brown Uni called Snowy, and another Uni, this one Pink, called Fred. They spent a lot of time together, playing all sorts of games in the heavy snow. They even ran into a Carrot Chia known as shiver_my_timbers or just Shiv. Snowy called him Carrots once, and from then on the name stuck. They made up all sorts of names. Brownie was nicknamed Kittycat, Snowy was Milady, and Fred was called Hank, just for fun. Ky herself was called Kiki, even though she said it made her sound like a Kiko. Ky told everyone about why she didn't have an owner, and everyone felt sorry for her. Then she mentioned how she was staying with the Negg faerie, and everyone got jealous. She loved it, and she loved her friends. Several months later, Ky was heading for the door to go meet her friends. She was just about to leave when she was bowled over by not one, not two, not three, but FOUR rambunctious Lupes, all the same age and all with petpets like Dragonacks, Turmacs, Babaas, and one had a Walking Carpet. Suddenly the little Negg shaped structure seemed a lot littler. A 14-year-old boy was vainly trying to herd the Lupes outside, but they weren't budging (partly because no one could move). The Lupes were laughing and shoving things around, and Ky found herself trapped by her wings under a chest of drawers and a portrait of a starry Negg. The Negg faerie enhanced her voice so it boomed throughout the cabin. "ALL RIGHT," she said. "ALL FOUR LUPES GET OUT. KY, YOU CAN STAY. YOU'VE GOTTA MEET MY IXI," she added to the boy, forgetting that her voice was louder than normal. While the boy tried to restore his hearing, the Faerie herded the Lupes and their petpets out. "OK," she boomed. "SHALL WE GET ON WITH IT THEN?" The boy whimpered in protest, and the faerie remembered her voice. "Oh, sorry," she whispered, and restored her vocal cords to normal. "There. Now, where's my Ky?" she asked. "I'm over here," piped up Ky, pawing at the ground with her hoof. The faerie and owner ran over to free her. Once free, she flapped her wings gingerly (they were rather sore) and trotted up to the two humanoids. "Hi," she said, extending her front hoof pleasantly. "My name is Kylie_872, but you can call me Ky." The boy shook it and introduced himself as XxdoomzxX, or just doomz for short. He listened to Ky's story as told by the Negg faerie, and was shocked to find that Bree was Ky's owner, because he knew her from that strange outside realm of "Earth". Ky grinned even wider than she had when she had eaten the Smiley Negg. "That's BRILLIANT!!" she shrieked. "You can take me HOME and I can see my FAMILY again!!!" Then she stopped cold. 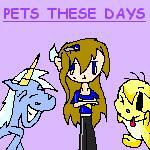 "Unless…" she continued uncertainly, "what if Bree has another pet? Like, to replace me?" Doomz smiled. "I tell you what," he said. "I'll Neomail her and tell her I found you. Come with me." If you’re wishing for a vacation that just screams of relaxation, fun and memories, then you need to keep reading, for I am about to tell you all about Kiko Lake and how you can have a great time!